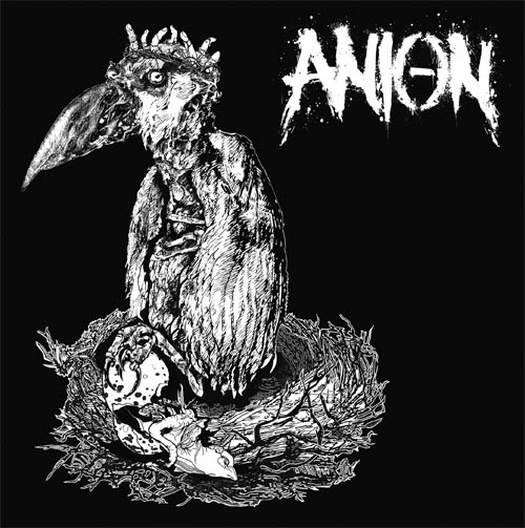 Vancouver, BC-based Anion have dropped a grotesque slab of anger on the world in the form of their new seven-inch, Carrion King. Composed of five incensed, emphatic tracks (the longest of the bunch well under five minutes), Carrion King is a succinct but lugubrious EP. The distortion and torturous roaring of the vocals conjure something rotten, flesh torn off in chunks. "Piss Warm Goat's Milk" has an aggressive, spraying structure to the riffs, spitting out teeth like machine gun fire. "Corspeflower" is the heaviest, sludgiest track, and a particularly successful one at that. It best showcases the sloping, circular song structures the band employ, circling like clotted blood around a drain. The vinyl is curdled purple, the colour of a bruise just beginning to fade, which suits Anion's sound perfectly.